Copyright © 2011 Vapor Blast Manufacturing Co. All rights reserved. deburr or polish by other means. tolerances. Will hold a 5 RMS. 3.) 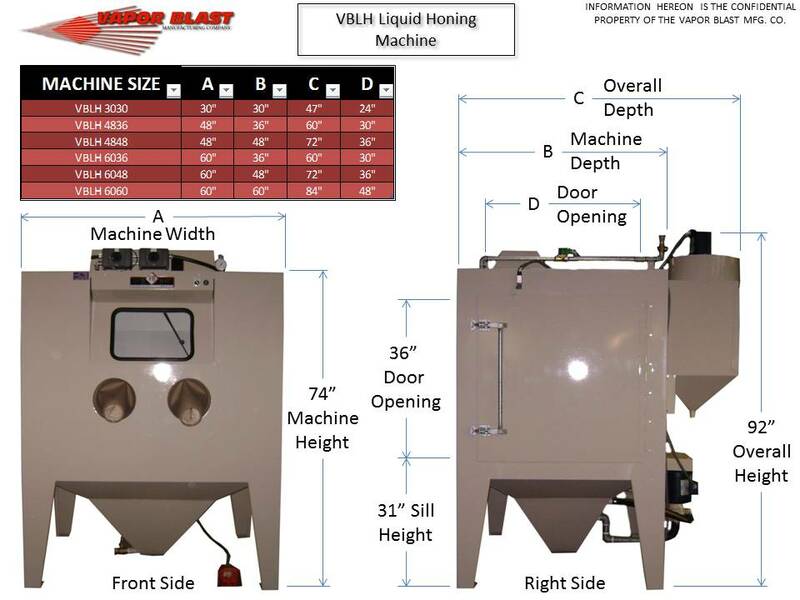 Vapor Blast Liquid Honing produces a very smooth surface with non-directional, finely etched, non-mirror (matte) finish. 4.) Peening with glass beads improves surface tensile strength by cold-working the metal. What ever your surface treatment problem, Vapor Blast can solve it! 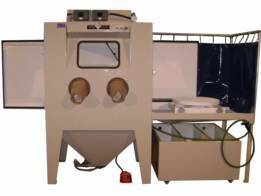 Interior Dimensions: 60'' x 36'' x 42"
Overall Dimensions: 64" x 60" x 92"
Stainless Steel Air Jet, Diameter: 1/4"
ABRASIVE MEDIA IN THE SLURRY HOPPER. WATER DISCHARGED FROM THE CABINET WINDOW WASH.
TIMER-CONTROLLED, AUTOMATIC SYSTEM OF FRESH WATER RINSE OF EXHAUST FILTER. WITH NON-FERROUS INTERIOR PIPING SYSTEM AND COATED WORKTABLE. FEATURINGDOUBLE PULLEY COUNTERBALANCED SYSTEM AND SELF-ACTIVATING SAFETY BRAKE. INTERLOCKED SAFETY SWITCH PREVENTS MACHINE OPERATION WHEN DOOR IS OPENED. HEAVY-DUTY, BALL BEARING SPINDLE MOUNTED, MANUAL ROTARY TURNTABLE ASSEMBLY. RINSING SOLUTION AND IS FITTED WITH A DRAIN UTLET. DOWN PROCESS OPERATION WHEN OPENED. OPTIONAL LOAD/UNLOAD STATIONS ARE PRESENT. 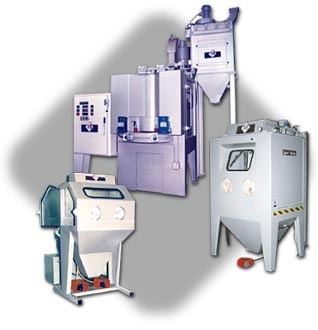 EFFICIENTLY DROPS OUT MEDIA PARTICULATES AND WATER DROPLETS FROM THE EXHAUST GAS STREAM. THE RECOVERED EXHAUST PRODUCTS ARE RETURNED TO THE BLAST CABINET FOR RE-USE.